At Atlas Autos, we believe in managing inventories in the most efficient and effective manner for our customers. Using state-of-the-art Just-In-Time (JIT) inventory management system, our Material and Parts Management division integrates the flow of supplies to an optimum level which ensures that the right materials are received and stored at the right place and delivered to the customer at the right time in the right quantities. This ensures efficient utilization of space while minimizing costs. 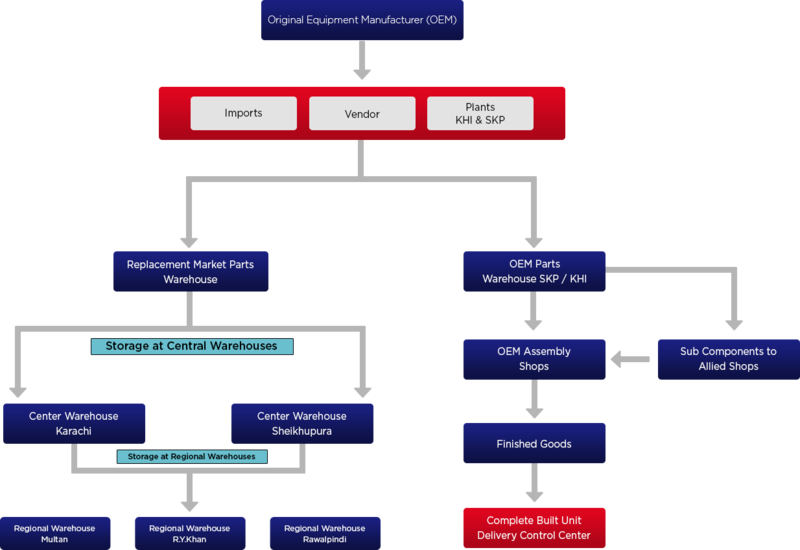 Our Parts Warehousing is divided into three major categories. Parts Warehousing division also persons various activities including receiving, packing, stacking, storage, issuance of materials, semi-finished parts and finished parts to various production shops and other departments. It is also responsible to move parts from plant to plant, warehouse to plant and company to company. Moreover, we believe in establishing state of the art warehousing facilities in the form of Central and Regional Warehouses for managing inventories in the most efficient and effective manner.